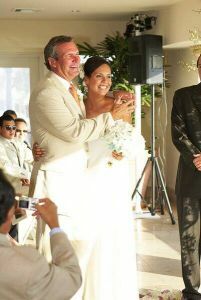 11 Years ago I was blessed to marry my “Twin Flame” Margot Uceda Murphy, it was the most beautiful day and one that I will never forget! For 10 years Margot taught me how to love! And in her death, how to finally accept love. For the past 6 years, through her spirit she has guided me and my life and continued to teach me. Margot understood that all that mattered was love and that everything is created only through love. The more powerful the love the more beautiful the creation! For anyone struggling with grief, you can transcend it, I promise you. I have been blessed with a second chance at love, and you can too. My friend Ellen Daly has written an amazing book with me that chronicles this amazing woman and how I was blessed to be a witness as she transcended immense suffering and even death right before my very eyes! Although this powerful and beautiful book will not be published until the fall of 2018, here is an excerpt of that beautiful day 11 years ago! 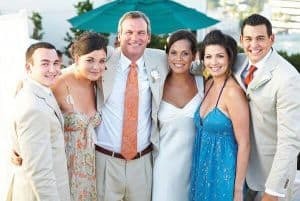 This scene from the book was a flashback from a day just 6 months before Margot’s death as we renewed our marriage vows before family and friends. My wish is that for anyone longing for love that you will find it and embrace it with everything that you are, for that is who we truly are and what our life is truly about! 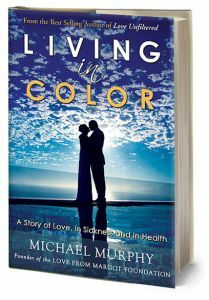 The following is an excerpt from the book Living in Color, copyright Michael Murphy. We were married just a couple miles from here, in Santa Monica, in September 2006, a little over four years ago. It was one of those perfect, magical days that stood out like an oasis amidst the often crazy volatility of our lives. I remember her saying to me, back when her sister got married, that “a marriage can only survive if there is a touch of heaven to begin with.” Well, that day was our “touch of heaven.” We were living just a block from the ocean, and our building had an enormous roof terrace that we used for the reception. I’m transported back there as I look at the pictures—the soft ocean breeze, the palm trees, the white puffy clouds dotting the impossibly blue sky. Margot, stunning in an elegant white dress; her own hair, dark and glossy, pinned up with white flowers; her gorgeous eyes huge and soft. My two sons, so grown up in their suits, and my lovely daughters making sure every detail of every place-setting and flower arrangement was perfect. My little granddaughter Sailor, almost four, taking her responsibility as the eldest flower girl very seriously. Lola’s two-year-old daughter Portia, who I could now officially call my niece, looking adorable in orange silk and a crown of flowers, which she kept taking off and throwing on the floor. We made our vows in a beautiful room on the top floor, overlooking the ocean. This almost proved to be a problem, because our dear friend and minister Ron confessed to me just days before the service that he was terrified of heights, and wasn’t sure he would be able to go through with the ceremony, standing in front of those floor-to-ceiling windows eighteen stories above the ground. We had to find an emergency backup, Margot’s old boss Eddie, who’d performed only one wedding in his life, and fly him down to be on hand in case Ron made a run for the elevator. But in the end, he overcame his fears and did a wonderful job. I don’t remember much of what I said at the altar, but I do remember we had to stop in the middle of Margot’s vows because everyone was laughing so much after she said to me, “You are my hero…and my greatest challenge.” She also said one other line I’ll never forget: “In the hardest, darkest hours you held on to me, as I held onto life for you.” I’d once told her I would die for her. It turned out that the much greater task was for her to live for me. After we exchanged rings and were pronounced man and wife, I kissed Margot, and the musicians began playing Shania Twain’s song “Still the One.” The opening lyrics—Looks like we made it, Look how far we’ve come my baby, We mighta took the long way, We knew we’d get there someday—sent a ripple of laughter around the room among our friends and family who knew just what a rollercoaster ride it had been for us to get to this point. Everyone sang along with the chorus, and I stood there with my beautiful wife, feeling like we really did make it. Just look at us holding on. We’re still together, still going strong. I had no idea what lay ahead of us, but at that moment it seemed like surely the worst must be behind us. Afterwards, overlooking the Pacific, the sun setting, we had a sumptuous dinner on the roof terrace, catered by one of Margot’s dearest friends, Stephanie. I made the toast myself, ending by telling everyone how I’d learned in my time with Margot that the famous quote from the movie Love Story—“Love means never having to say you’re sorry”—is not true. I’d become quite adept at saying I’m sorry, I admitted. But I also had learned that love is a choice—you choose who you’re going to love, and how you’re going to love. And ultimately, life is about love. “Choose love,” we toasted. After our first dance, we cut our cake. Margot held Sailor in her arms as I fed her the first bite, laughing as the frosting got smeared on her nose. My favorite image from that day now hangs above the fireplace. It was taken on the edge of the roof terrace, where only a glass barrier separated us from the deep-blue sky, filled with tiny, white clouds lit up by the sunset. We are standing silhouetted against this dramatic backdrop, kissing, on the edge of a pool, which perfectly reflects the sun and sky. When I look at that picture—just her and I, merging together into one silhouette, on the edge of that rooftop, I am always reminded of something she wrote to me, early on: “I want to know that I can stand on the edge of life and when I look back you’ll be there, smiling.” That night, finally husband and wife, we stood on the edge of life together, feeling invincible. I hear a shuffling of feet and people moving, and see Margot starting to descend the curving staircase down the side of the room, which is lined with friends and family. She was supposed to wait till the song was half way through, but I guess she wasn’t able to take in too much when I’d explained to her the order of events. 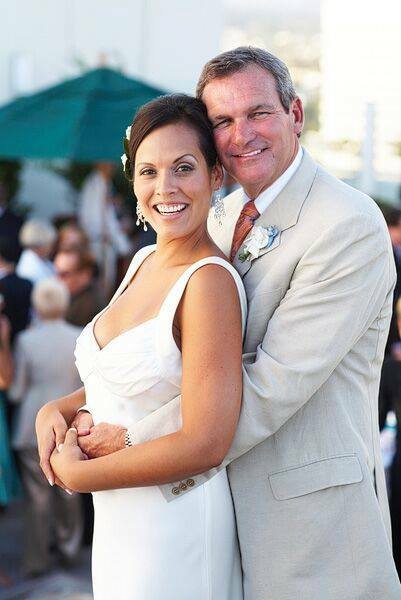 To me, she’s even more beautiful than the day we were married. Her loose, white, sequined tunic falls just above her knees, and she’s wearing matching slippers. Only I know how beat and bruised and weak her body really is under that lovely dress. Big, dramatic earrings sparkle against her dark hair, which you’d never guess was a wig. She looks so vulnerable—a little disoriented as she makes her way down, but as her eyes meet mine and she walks towards me, she relaxes, smiling radiantly. I lean down to kiss her, and I can see that the shadows of pain have lifted from her eyes, which are clear and soft with love—and more than a little morphine. But she’s there. Even the drugs can’t dull her joyful presence tonight. I wrap my arm around her and hold her close as the song continues.